Walk through a landscape that echoes with the sounds of footsteps long since gone, where the horizon is endless and the sky vast in its daytime blue and starry night. Create memories that link you to an ancient place, renowned for its extraordinary indigenous culture. 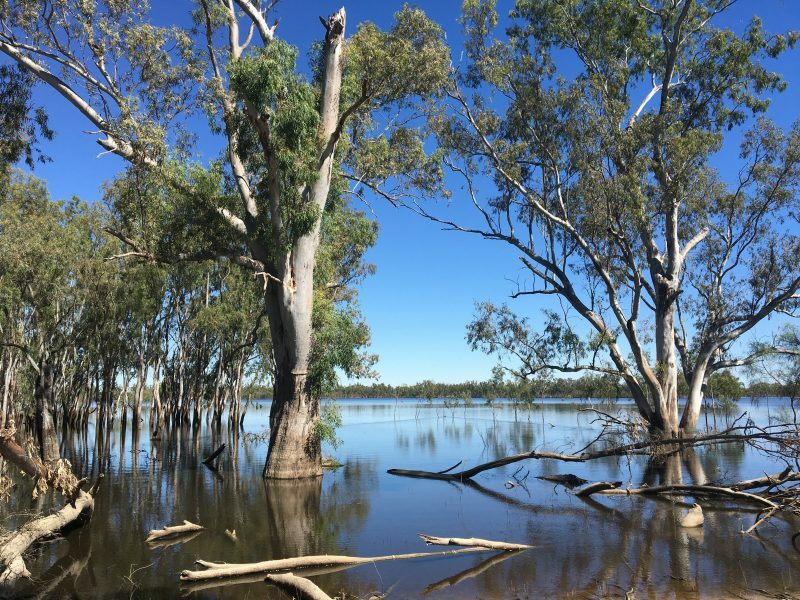 Discover our region’s rich history and explore a land of contrast, where wetlands meet dunes and semi-arid plains, linked by Australia’s longest river, the Murray. The bush comes alive with your every step: see emus racing, kangaroos bounding and hear the call of birds from the trees overhead. Dine next to an open fire on a sandbank by the river, or experience the “food-bowl” of Australia at a local winery or brewery. Delivering year-round access to these unique locations, we offer personalised tours in the comfort of an all-terrain 4WD vehicle. This is wild, beautiful country, that is only fully appreciated with guides who know its secrets. 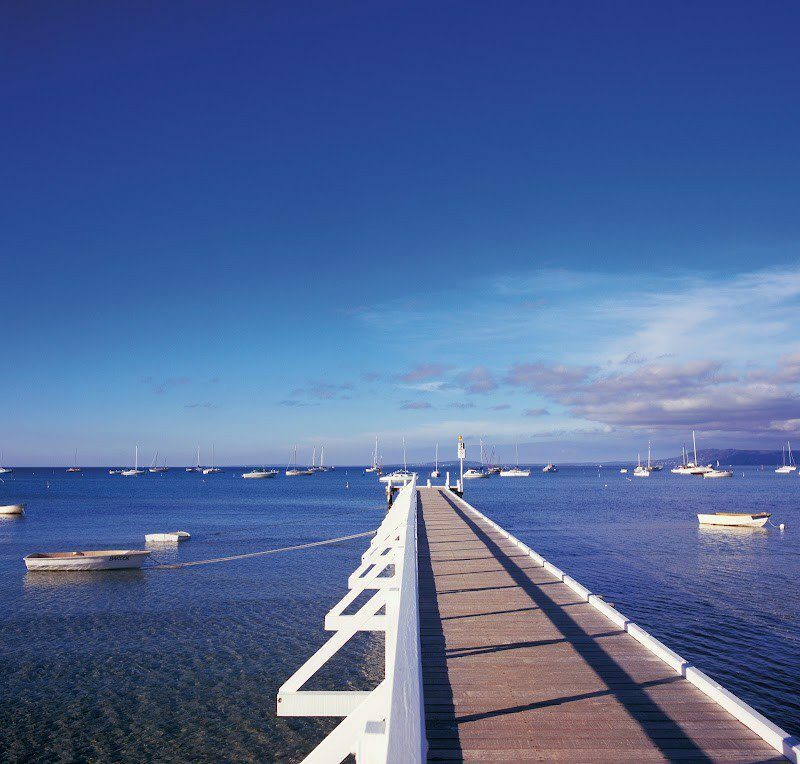 Join us and experience the outback without leaving Victoria. 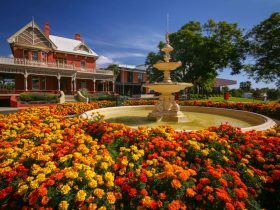 Mildura, a six hour drive from Melbourne, or a one hour flight. With over 30 years’ experience in Natural Resource Management around the Victorian Mallee waterways and bush blocks. Share these fantastic experiences through Murray Offroad Adventures outback tours. Murray Offroad Adventures’ Hattah Lakes Tour is a half day tour of Hattah/Kulkyne National Park. Travel in comfort to experience this internationally listed RAMSAR National Park full of many heritage values. 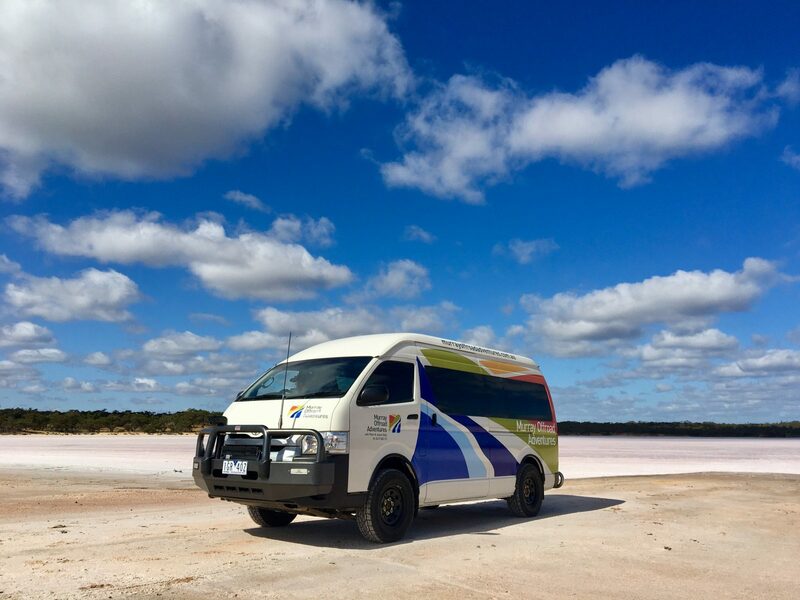 Drive through a unique area that changes from waterways and floodplain forests through to open pine woodlands and our dense Mallee landscapes. Observe the rich diversity of plants and wildlife that thrive near the many Lakes. Travel west from Mildura to South Australia, through Ned’s Corner Station. Enjoy morning tea with the emus at Lake Walla Walla. Drive along the state border and discover its interesting history. Visit the Woolshed Brewery on Wilkadene Station. 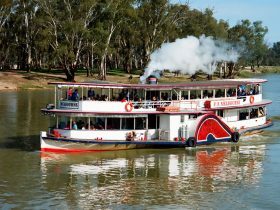 Enjoy the unique crafted beers, a brewery tour, history of the old station and lunch under the Red Gums on the balcony overlooking the beautiful Murray River. Journey west of Mildura into the Millewa-Mallee region. Travel back in time learning about the changing landscapes, indigenous history, and early farming settlement. Enjoy morning tea while strolling through treasures of the past at the Millewa pioneer settlement at the small township of Meringur. Return to Mildura via the Murray River and the vastness of semi-arid landscapes. 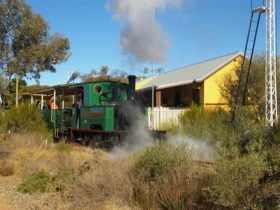 Visit the old Ned’s Corner station – once the largest working station in Victoria, now the largest privately run conservation property in the state. scattered along the magnificent Murray river. 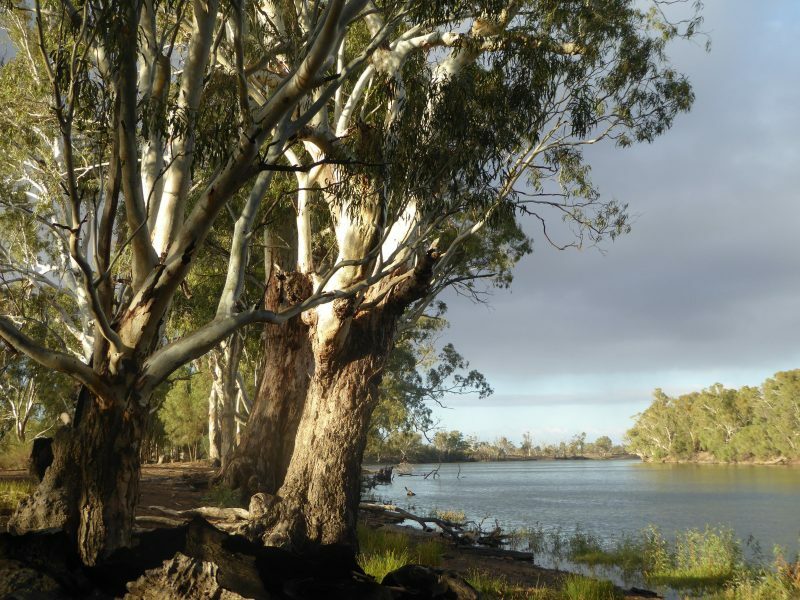 Enjoy lunch under massive ancient red gums on the banks of the Australia’s longest river. shell middens and old campsites. Observe kangaroos, emus and other wildlife in their natural habitat. The tour can be tailored to suit your requirements. Enjoy a shorter Offroad experience exploring Murray River Wetlands. Experience the unique forest and grasslands, sand dunes, wetlands and the wildlife. Then relax while wine tasting and dining on the banks of the Murray River at the picturesque Trentham Estate Winery. Enjoy a full bush buffet breakfast with local wildlife overlooking the billabong. Take a stroll through shady woodlands. Travel in air conditioned comfort in a 10 seater bus. Meander along bush tracks beside the Murray with a knowledgeable guide. A shorter, relaxing and informative tour. Fantastic way to start the day. Be inspired by Giant artworks painted onto the Old Mallee Wheat silos. Visible from miles away in this southern Mallee farming landscapes of the Yarriambiack shire. Then drift to the west of Patchewollock for a taste of the 108 years old Wyperfeld National Park with white sandy lunettes, wide open lake beds open forest woodlands and the sandy tracks of the Mallee dunes. Stay overnight in the Pine Plains Log cabins. Visit Lock 11. Gain an understanding how locks have been used and how they may change in the future. Travel in air conditioned comfort in our offroad bus through red gum and black box woodlands. Discover their hidden treasures. Wind along scenic bush tracks beside the Murray River. Enjoy a stroll across the board walk near Butler’s creek and appreciate the cultural heritage silently scattered Visit the old pumping station. 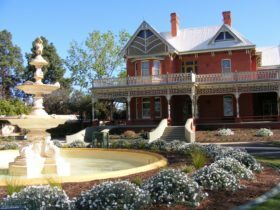 Travel to Merbein take in the scenic views from ancient white cliff overlooking the Murray. Murray Offroad Adventures’ Hattah Lakes Tour is a full day tour of Hattah/Kulkyne National Park. Travel in comfort to experience this internationally listed RAMSAR National Park full of many heritage values. Then travel our to the ancient landscapes of the Raak plain and enjoy the extreme wide open spaces. Experience wildlife, from the sugar glider to reptiles. Get to understand Indigenous culture first hand and have a master chef cooked meal on one of the massive private sandbars. Tour starts in Mildura at 2:00pm day one and finishes 10:00am day four at Mildura.